This is ugly. The good news? Things are moving in the right direction. Havasu Falls is one of the most picturesque waterfalls in the country, if not the entire planet. 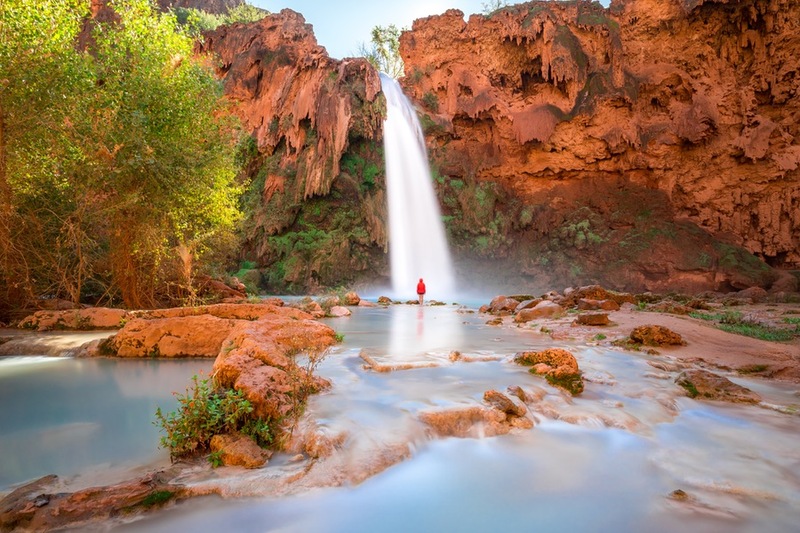 Nestled deep within the Grand Canyon on the Havasupai Indian Reservation, thousands of visitors are flocking each year to get a glimpse of the pristine turquoise waters that make the falls so special. The destination is rapidly growing in popularity as vacationers post exquisite photographs of the falls on social media. This is the means by which my sister and I learned about this beautiful place, and we immediately made reservations to stay for a few nights. Getting there is no easy task, as the 10-mile trail from the Hualapai Hilltop to the campground is not accessible by car. Access to the falls is available by helicopter, but most tourists opt to hike in, and many use pack horses and mules to pack their gear, to make the hike less physically taxing. Unfortunately, we learned very quickly that the gorgeous pictures we had marveled at on Instagram and Facebook, our very inspiration for making this journey, were not an accurate representation of all that one will witness while visiting Supai. Just before dawn on April 19, 2016, my sister and I began the journey from the start of the trail at the Hualapai Hilltop. As we descended into the canyon, it wasn’t long before we came upon the first string of packhorses quickly approaching. We were immediately struck by how sickly many of them looked, noting not only how malnourished they appeared, but also how several of them had open sores where the leather on the pack saddles and straps had rubbed them raw. We looked at each other in shock and discussed our relief at having packed our equipment in ourselves rather than having paid to use the services of these horses. The effects on this community as a result of years of impoverishment were not lost on us; we knew we’d observe animals that were underfed and somewhat atrophied, but this seemed like something more. As we entered the village, making our way to the tourist office, we passed numerous pens containing horses that were emaciated; some eating their own dung or garbage. Later in the evening, after the pack horses had been retired for the day, we witnessed horses that had moderate to severe wounds, where their hides had been split open from heavy loads and ill-fitting saddles. We photographed some of the worst cases, where some had backs that were gushing with blood, with the bones in their spine exposed. We wondered how so many of these severe injuries could possibly go unreported…and later surmised that they go largely unnoticed by many tourists as they are hidden away under packsaddles and camping gear; only at the end of the day when the saddles are removed would these injuries become visible. We decided that we could not ignore this. Upon our return home, we began to research our options. We understood that because these actions are taking place on tribal land, and the Havasupai are their own sovereign nation, regular means of law enforcement would not necessarily apply. This would make our quest for justice for these animals an arduous one. Was there a way to provide immediate help some of the most habitually abused and neglected horses and also offer resources to the tribe so that different procedures could be implemented moving forward? Was there a path to holding chronic abusers of these horses accountable for their actions and rescuing horses that were in the most deplorable of conditions, while also encouraging and fostering existing good practices for horse owners who were acting responsibly? We soon learned that addressing these questions in a sensitive manner for the sake of the tribe, yet holding firm with our conviction that the abusers in the community must be held liable, proved to be an enormous challenge. The first step was to contact members of the Havasupai Tribal Council to voice our concerns and to ask how we could work together to resolve this. We emailed every available contact listed on their official website and left voicemails on every phone line. Days passed with no response. We tried again once more, this time also phoning and emailing the Bureau of Indians affairs, and like our first attempts, we were met with silence. It was then decided that sharing our photographs and story on social media would at the very least, help to spread awareness to the general public. More importantly we hoped this knowledge would be passed to tourists travelling there, with the hope that they would elect to travel with compassion and pack in their own equipment or use the helicopter, rather than to use one of these animals. We also included a petition, created by another group of citizens concerned for the welfare of these animals, which implores the Havasupai Tribal Council to establish and implement a minimum standard of care for these horses and to stop the violent individuals responsible for the most atrocious acts of cruelty. The Facebook post we made went viral. 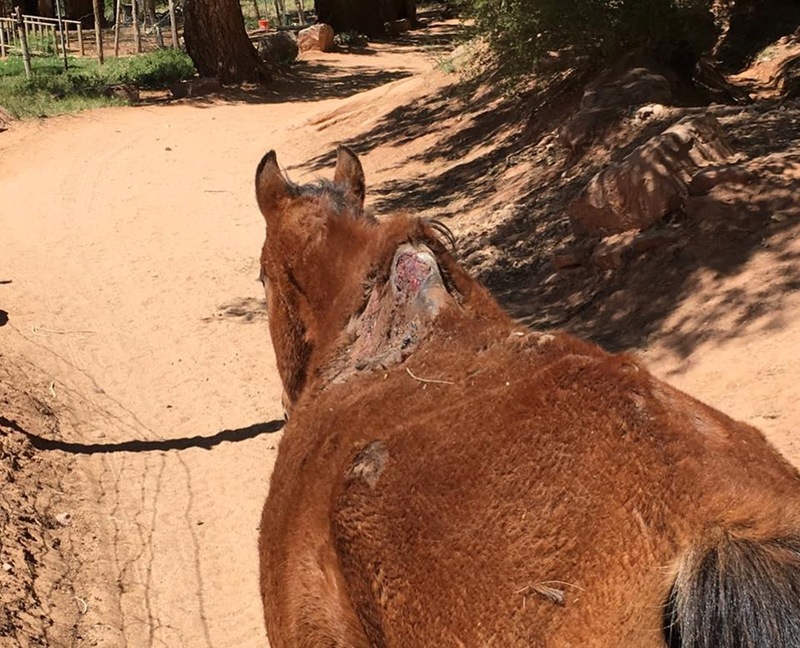 Not only was it shared almost twenty-one thousand times, but the comments and private messages that came flooding in after, from tourists who had visited Supai before we had been there, began to illuminate a deeply disturbing pattern of enduring and violent abuse of these horses and mules that has been spanning decades. Some said they saw horses being punched and kicked on the trail after they had collapsed from exhaustion and could not take another step forward. 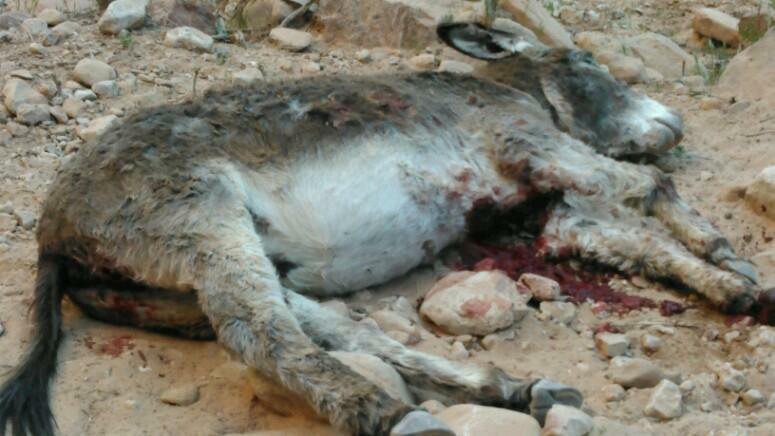 Others said they saw a mule being beaten with a chain as it lay on the ground from fatigue. More still, have watched horses plummeting off the switchbacks from weariness, and left there by their handlers, on the canyon floor to die, rather than be euthanized or given any veterinary treatment. One said they witnessed these acts of cruelty as far back as 2006. Another said they noticed this as far back as 1989…The petition, which now has nearly two hundred thousand signatures, catalogues even more stories of visitors witnessing brutal maltreatment, but didn’t think they could do anything about it because the abuse happened on tribal land and local authorities would have no power to stop it. The public outcry has been infectious. We utilized it to reach out to media outlets in order to keep pushing awareness. We joined forces with other individuals who expressed trepidation regarding this issue and pressed several of the tour outfitters who lead trips to Havasupai Falls to cease the use of the packhorses. None were willing to address there is an ongoing problem…until just recently. After being faced with the continuing negative publicity, Wildland Trekking, one of the larger of several tour outfitters offering guided trips in Havasu, announced their suspension of use of pack animals. On June 1st 2016, in a statement from Steve Cundy, Director of Sales and Customer Service, Wildland Trekking will move forward, “…using a combination of porters and the existing helicopter service to transport supplies in and out of Havasu Falls. Backpacking options will also be available. There will be a transition period where we work to hire and train a crew of porters and develop the needed infrastructure. People who are already booked will be accommodated under this new system”. By taking leadership on this issue where others would not, Wildland Trekking may have just changed the game. Their willingness to acknowledge that this has been an ongoing problem that can no longer be ignored and modify their business practices as a result, displays an integrity we are now asking from the rest of the tour operators working in Havasupai. Outfitters who profit off the backs of these animals need to actively participate to ensure their welfare. It’s not just good business practice, it’s an ethical responsibility. We urge these companies to revise their practices in one of two ways. Primarily, we’d like to see tour business eliminate packhorses as an option and replace them with a viable alternative, just as Wildland has, so that human porters and the helicopter become the sole methods for hauling gear, beyond guests packing their own equipment. The second approach would be to require outfitters to contribute their own income to help employ an enforceable standard of care. Part of that requirement would necessitate that the tribe allow an independent entity to regularly come to Supai to ensure compliance to confirm that the animals are receiving adequate water and feed on a consistent basis at the Hilltop and in the village, proper rest, consistent veterinary and farrier care, and an animal husbandry education program. Most importantly, this includes reporting and prosecuting abusers. Demanding both parties be accountable for the care and treatment of these animals would be a solution that would allow for long term and sustainable improvements in the lives of these horses, and it is extremely overdue. Although bringing legal action to incidents of animal abuse taking place on tribal land is difficult, it is not impossible. Case law has now been established for federal authorities to intercede in animal abuse cases on tribal land. 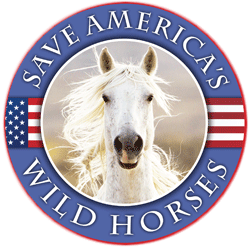 On April 14, 2016, Leland Joe of Havasupai was arrested by federal officials for two felony and two misdemeanor counts of animal cruelty and abuse to trail horses. Four of his horses were confiscated. This was a monumental day, as it was the first time an arrest of this kind has occurred on tribal land. His arrest was spurred by a vocal group of alarmed citizens, all whom had witnessed the abuse of these animals first hand, coming together and reaching out to various federal agencies. There are many tourists whom have witnessed abuse and stayed quiet about it upon returning home, often because they assumed there was nothing they could do, or that their single voice would not be enough. As we have learned by sharing our story, and in light of the recent arrest of Leland Joe, this is not true. It is critical that tourists document this abuse by taking photos, videos and providing written statements recounting what they saw. Both the FBI and Bureau of Indian Affairs should be contacted to report any documentation of abuse that is observed. Tourists should also reach out to Supai government officials. They have a website with email addresses for the various council members, and a mailing address. Employing a standard of care is the ideal long term solution, however, implementing such procedures may take a while for outfitters to embrace, so for now, the public can help foster a change for these horses by refusing to use tour companies that continue the use of these packhorses. Visitors can easily utilize the helicopter option provided by Airwest Helicopters. The best method of all however, is choosing to pack your items yourself. Havasupai is a beautiful destination. The journey there will be made so much sweeter by choosing to explore it with compassion. Let’s offer a voice, in this place, to these animals who cannot speak for themselves. This is how change comes about. This is why are country is where it is today. People became immune to getting involved whether it be shootings, muggings or cruelty to animals. Americans need to wake up and fight compassion and care. Sometimes all it takes is one voice to talk to another and another. Hold our Legislators accountable for their lack of accountability. Wrong is wrong!! Period! Where was all the money going that they received from the tours because I bet the tour wasn’t cheap. Kudos to these ladies because they brought attention to the plight of these poor animals. Take a stand and speak up you just might make change. Great job and great story!!! Seems like if there were comments & complaints about this with photos – why would people continue to use these outfitters or go to this area? Animal abuse is just that – abuse. Keeping silent? 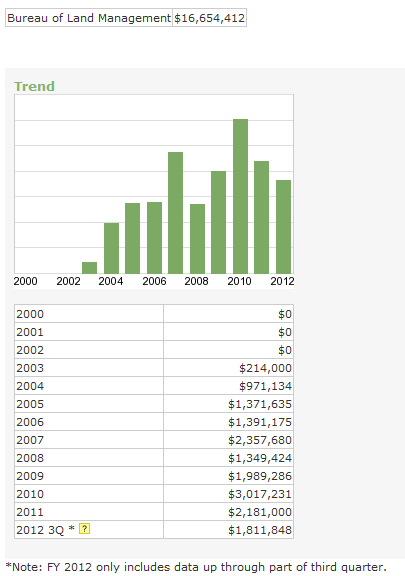 Michelle has certainly earned more than a pat on the back! Don’t be surprised if the majority of individuals are unaware of this situation. That’s why it is always a good idea for people to look into any animal-related business before supporting them. Humans can make a difference and these ladies put together a plan of action that has obviously snow-balled into many people “speaking” for the abused animals and although the entire problem may not be corrected yet it sounds like at least those animals are not being forced to endure the abuse. I do hope that this issue will be followed through with by future Grand Canyon visitors and not allowed to be swept under the rug. Cruelty to animals, also called animal abuse or animal neglect, is the intentional infliction by humans of suffering or harm upon any non-human animal, for purposes other than self-defense or survival. Please call Wildland Trekking Company in Flagstaff and demand that they STOP using the pack animals until ALL the wranglers are in compliance with basic humane standards of care: 1-800-715-5543 Ask for Scott, one of the owners. Only 3 comments on the site of this article! Well 4 with mine. The pictures were absolutely horrible. Altho one was taken by a humane organization, so maybe something more will be done. Just blows my mind that even if someone couldn’t see the terrible wounds – the thinness of these horses should be clear to ANYONE! Frankly, that’s one place that wouldn’t be on my bucket list! Beautiful scenery, I’m sure – BUT. Heartbreaking to the extreme. How could this barbaric cruelty continue for so long, and has there been any improvement in this treatment of these helpless animals, who are pushed beyond endurance and dying horrible deaths? Has there been any real progress? It is horrific that human beings could have subjected helpless animals to such cruelty for YEARS and nobody did a thing. How could anybody participate by using those downtrodden weary animals? People who would participate in this uncivilized cruelty are just as bad as those who force such cruelty on the pack horses. It’s been a long time since my stomach ached (reading about Havasu Falls and the animals. I truly hope the cruelty ends and soon. It’s been a long time since my stomach felt very very sick but reading about Havasu Falls Canyon and the animals – I had to visit the bathroom. This has to end and end now. This is tragic but what will happen to these pack animals if they are no longer needed? Most will end up shipped to slaughter. A better answer would be enforced humane standards as well as more national attention to the third world conditions on our reservations, conditions which are dire for people and animals. I for one appreciate sharing the trail with a good horse, mule, or burro, and good outfitters and packers know it is an art to keep animals healthy and happy while carefully balancing loads (good ones use a scale every time). Getting rid of all these animals and replacing with helicopters etc. is not a better situation, in my view, since it will further victimize them. Lifting the tide so people and animals can have better lives is a better strategy. SAVEfoundation and others have been trying to get the tribe to improve the welfare of their horses for years. Their response is to become irate and threatening to hikers who show concern, and ignore pleas for help. There have been many offers of help from all sides, vet care, donations, food, etc and they still continue to abuse/neglect/starve their animals. If you want to help please visit these links. You can now DONATE to a coalition of groups that is working on a solution.